Using a new approach, scientists at The Scripps Research Institute (TSRI) and collaborating institutions have discovered a novel drug candidate that could be used to treat certain types of breast cancer, lung cancer and melanoma. The new study focused on serine, one of the 20 amino acids (protein building blocks) found in nature. Many types of cancer require synthesis of serine to sustain rapid, constant and unregulated growth. To find a drug candidate that interfered with this pathway, the team screened a large library of compounds from a variety of sources, searching for molecules that inhibited a specific enzyme known as 3-phosphoglycerate dehydrogenase (PHGDH), which is responsible for the first committed step in serine biosynthesis. “In addition to discovering an inhibitor that targets cancer metabolism, we also now have a tool to help answer interesting questions about serine metabolism,” said Luke L. Lairson, assistant professor of chemistry at TSRI and principal investigator of cell biology at the California Institute for Biomedical Research (CALIBR). Lairson was senior author of the study, published recently in the Proceedings of the National Academy of Sciences (PNAS), with Lewis Cantley of Weill Cornell Medical College and Costas Lyssiotis of the University of Michigan. Serine is necessary for nucleotide, protein and lipid biosynthesis in all cells. Cells use two main routes for acquiring serine: through import from the extracellular environment or through conversion of 3-phosphoglycerate (a glycolytic intermediate) by PHGDH. “Since the late 1950s, it has been known that cancer cells use the process of aerobic glycolysis to generate metabolites needed for proliferative growth,” said Lairson. This process can lead to an overproduction of serine. The genetic basis for this abundance had remained mysterious until recently, when it was demonstrated that some cancers acquire mutations that increased the expression of PHGDH; reducing PHGDH in these “serine-addicted” cancer cells also inhibited their growth. The labs of Lewis C. Cantley at Weill Cornell Medical College (in work published in Nature Genetics) and David Sabatini at the Whitehead Institute (in work published in Nature) suggested PHGDH as a potential drug target for cancer types that overexpress the enzyme. Lairson and colleagues hypothesized that a small molecule drug candidate that inhibited PHGDH could interfere with cancer metabolism and point the way to the development of an effective cancer therapeutic. Importantly, this drug candidate would be inactive against normal cells because they would be able to import enough serine to support ordinary growth. Lairson, in collaboration with colleagues including Cantley, Lyssiotis, Edouard Mullarky of Weill Cornell and Harvard Medical School and Natasha Lucki of CALIBR, screened through a library of 800,000 small molecules using a high-throughput in vitro enzyme assay to detect inhibition of PHGDH. The group identified 408 candidates and further narrowed this list down based on cell-type specific anti-proliferative activity and by eliminating those inhibitors that broadly targeted other dehydrogenases. With the successful identification of seven candidate inhibitors, the team sought to determine if these molecules could inhibit PHGDH in the complex cellular environment. To do so, the team used a mass spectrometry-based assay (test) to measure newly synthesized serine in a cell in the presence of the drug candidates. One of the seven small molecules tested, named CBR-5884, was able to specifically inhibit serine synthesis by 30 percent, suggesting that the molecule specifically targeted PHGDH. The group went on to show that CBR-5884 was able to inhibit cell proliferation of breast cancer and melanoma cells lines that overexpress PHGDH. As expected, CBR-5884 did not inhibit cancer cells that did not overexpress PHGDH, as they can import serine; however, when incubated in media lacking serine, the presence of CBR-5884 decreased growth in these cells. The group anticipates much optimization work before this drug candidate can become an effective therapeutic. In pursuit of this goal, the researchers plan to take a medicinal chemistry approach to improve potency and metabolic stability. Working with human breast cancer cells and mice, scientists at The Johns Hopkins University say new experiments explain how certain cancer stem cells thrive in low oxygen conditions. Proliferation of such cells, which tend to resist chemotherapy and help tumors spread, are considered a major roadblock to successful cancer treatment. The new research, suggesting that low-oxygen conditions spur growth through the same chain of biochemical events in both embryonic stem cells and breast cancer stem cells, could offer a path through that roadblock, the investigators say. A summary of the findings was published online March 21 in the Proceedings of the National Academy of Sciences. All stem cells are immature cells known for their ability to multiply indefinitely and give rise to progenitor cells that mature into specific cell types that populate the body’s tissues during embryonic development. They also replenish tissues throughout the life of an organism. But stem cells found in tumors use those same attributes and twist them to maintain and enhance the survival of cancers. Recent studies showed that low oxygen conditions increase levels of a family of proteins known as HIFs, or hypoxia-inducible factors, that turn on hundreds of genes, including one called NANOG that instructs cells to become stem cells. Studies of embryonic stem cells revealed that NANOG protein levels can be lowered by a chemical process known as methylation, which involves putting a methyl group chemical tag on a protein’s messenger RNA (mRNA) precursor. Semenza said methylation leads to the destruction of NANOG’s mRNA so that no protein is made, which in turn causes the embryonic stem cells to abandon their stem cell state and mature into different cell types. Zeroing in on NANOG, the scientists found that low oxygen conditions increased NANOG’s mRNA levels through the action of HIF proteins, which turned on the gene for ALKBH5, which decreased the methylation and subsequent destruction of NANOG’s mRNA. When they prevented the cells from making ALKBH5, NANOG levels and the number of cancer stem cells decreased. When the researchers manipulated the cell’s genetics to increase levels of ALKBH5 without exposing them to low oxygen, they found this also decreased methylation of NANOG mRNA and increased the numbers of breast cancer stem cells. Finally, using live mice, the scientists injected 1,000 triple-negative breast cancer cells into their mammary fat pads, where the mouse version of breast cancer forms. Unaltered cells created tumors in all seven mice injected with such cells, but when cells missing ALKBH5 were used, they caused tumors in only 43 percent (six out of 14) of mice. “That confirmed for us that ALKBH5 helps preserve cancer stem cells and their tumor-forming abilities,” Semenza said. “There are still many questions left to answer but we now know that oxygen poor environments, like those often found in advanced human breast cancers serve as nurseries for the birth of cancer stem cells,” says Gregg Semenza, M.D., Ph.D., the C. Michael Armstrong Professor of Medicine and a member of the Johns Hopkins Kimmel Cancer Center. Chuanzhao Zhang, Debangshu Samanta, Haiquan Lu, John W. Bullen, Huimin Zhang, Ivan Chen, Xiaoshun He, Gregg L. Semenza. Pluripotency factors, such as NANOG, play a critical role in the maintenance and specification of cancer stem cells, which are required for primary tumor formation and metastasis. In this study, we report that exposure of breast cancer cells to hypoxia (i.e., reduced O2 availability), which is a critical feature of the tumor microenvironment, induces N6-methyladenosine (m6A) demethylation and stabilization of NANOG mRNA, thereby promoting the breast cancer stem cell (BCSC) phenotype. We show that inhibiting the expression of AlkB homolog 5 (ALKBH5), which demethylates m6A, or the hypoxia-inducible factors (HIFs) HIF-1α and HIF-2α, which activate ALKBH5 gene transcription in hypoxic breast cancer cells, is an effective strategy to decrease NANOG expression and target BCSCs in vivo. N6-methyladenosine (m6A) modification of mRNA plays a role in regulating embryonic stem cell pluripotency. However, the physiological signals that determine the balance between methylation and demethylation have not been described, nor have studies addressed the role of m6A in cancer stem cells. We report that exposure of breast cancer cells to hypoxia stimulated hypoxia-inducible factor (HIF)-1α- and HIF-2α–dependent expression of AlkB homolog 5 (ALKBH5), an m6A demethylase, which demethylated NANOG mRNA, which encodes a pluripotency factor, at an m6A residue in the 3′-UTR. Increased NANOG mRNA and protein expression, and the breast cancer stem cell (BCSC) phenotype, were induced by hypoxia in an HIF- and ALKBH5-dependent manner. Insertion of the NANOG 3′-UTR into a luciferase reporter gene led to regulation of luciferase activity by O2, HIFs, and ALKBH5, which was lost upon mutation of the methylated residue. ALKBH5 overexpression decreased NANOG mRNA methylation, increased NANOG levels, and increased the percentage of BCSCs, phenocopying the effect of hypoxia. Knockdown of ALKBH5 expression in MDA-MB-231 human breast cancer cells significantly reduced their capacity for tumor initiation as a result of reduced numbers of BCSCs. Thus, HIF-dependent ALKBH5 expression mediates enrichment of BCSCs in the hypoxic tumor microenvironment. Scientists at the University of California, San Diego School of Medicine and Moores Cancer Center, with colleagues in Spain and Germany, have discovered how elevated levels of particular proteins in cancer cells trigger hyperactivity in other proteins, fueling the growth and spread of a variety of cancers. Their study (“Prognostic Impact of Modulators of G Proteins in Circulating Tumor Cells from Patients with Metastatic Colorectal Cancer”) is published in Scientific Reports. Specifically, the international team, led by senior author Pradipta Ghosh, M.D., associate professor at the University of California San Diego School of Medicine, found that increased levels of expression of some members of a protein family called guanine nucleotide exchange factors (GEFs) triggered unsuspected hyperactivation of G proteins and subsequent progression or metastasis of cancer. In recent years, circulating tumor cells (CTCs), which are shed from primary tumors into the bloodstream and act as seeds for new tumors taking root in other parts of the body, have become a prognostic and predictive biomarker. The presence of CTCs is used to monitor the efficacy of therapies and detect early signs of metastasis. Numerous efforts are underway to improve the value and precision of CTC analysis. According to Dr. Ghosh the new findings are a step in that direction. First, GEFs activate trimeric G proteins, and second, G protein signaling is involved in CTCs. G proteins are ubiquitous and essential molecular switches involved in transmitting external signals from stimuli into cells’ interiors. They have been a subject of heightened scientific interest for many years. Dr. Ghosh and colleagues found that elevated expression of nonreceptor GEFs activates Gαi proteins, fueling CTCs and ultimately impacting the disease course and survival of cancer patients. In the journal Biotechnology Bioengineering, the team reports on its “metastasis-on-a-chip” system believed to be one of the first laboratory models of cancer spreading from one 3D tissue to another. To create the system, researchers encapsulated human intestine and colorectal cancer cells inside a biocompatible gel-like material to make a mini-organ. A mini-liver composed of human liver cells was made in the same way. These organoids were placed in a “chip” system made up of a set of micro-channels and chambers etched into the chip’s surface to mimic a simplified version of the body’s circulatory system. The tumor cells were tagged with fluorescent molecules so their activity could be viewed under a microscope. To test whether the system could model metastasis, the researchers first used highly aggressive cancer cells in the colon organoid. Under the microscope, they saw the tumor grow in the colon organoid until the cells broke free, entered the circulatory system and then invaded the liver tissue, where another tumor formed and grew. When a less aggressive form of colon cancer was used in the system, the tumor did not metastasize, but continued to grow in the colon. To test the system’s potential for screening drugs, the team introduced Marimastat, a drug used to inhibit metastasis in human patients, into the system and found that it significantly prevented the migration of metastatic cells over a 10-day period. Likewise, the team also tested 5-fluorouracil, a common colorectal cancer drug, which reduced the metabolic activity of the tumor cells. The scientists are currently working to refine their system. They plan to use 3D printing to create organoids more similar in function to natural organs. And they aim to make the process of metastasis more realistic. When cancer spreads in the human body, the tumor cells must break through blood vessels to enter the blood steam and reach other organs. The scientists plan to add a barrier of endothelial cells, the cells that line blood vessels, to the model. This concept of modeling the body’s processes on a miniature level is made possible because of advances in micro-tissue engineering and micro-fluidics technologies. It is similar to advances in the electronics industry made possible by miniaturizing electronics on a chip. Bioengineers at Brigham and Women’s Hospital have developed a new technique to help determine if chemotherapy is working in as few as eight hours after treatment. The new approach, which can also be used for monitoring the effectiveness of immunotherapy, has shown success in pre-clinical models. The technology utilizes a nanoparticle, carrying anti-cancer drugs, that glows green when cancer cells begin dying. Researchers, using the “reporter nanoparticles” that responds to a particular enzyme known as caspase, which is activated when cells die, were able to distinguish between a tumor that is drug-sensitive or drug-resistant much faster than conventional detection methods such as PET scans, CT and MRI. The findings were published online March 28 in the Proceedings of the National Academy of Sciences. New lab-made nanoparticles deliver cancer drugs into tumors, then report their effects in real time by lighting up in response to proteins produced by dying cells. More light (right, green) indicates a tumor is responding to chemotherapy. Tiny biochemical bundles carry chemotherapy drugs into tumors and light up when surrounding cancer cells start dying. Future iterations of these lab-made particles could allow doctors to monitor the effects of cancer treatment in real time, researchers report the week of March 28 in theProceedings of the National Academy of Sciences. “This is the first system that allows you to read out whether your drug is working or not,” says study coauthor Shiladitya Sengupta, a bioengineer at Brigham and Women’s Hospital in Boston. Each roughly 100-nanometer-wide particle consists of a drug and a fluorescent dye linked to a coiled molecular chain. Before the particles enter cells, the dye is tethered to a “quencher” molecule that prevents it from lighting up. When injected into the bloodstream of a mouse with cancer, the nanoparticles accumulate in tumor cells and release the drug, which activates a protein that tears a cancer cell apart. This cell-splitting protein not only kills the tumor cell, but also severs the link between the dye and the quencher, allowing the nanoparticles to glow under infrared light. Ashish Kulkarnia,b,1,Poornima Raoa,b,Siva Natarajana,b,Aaron Goldman, et al. The ability to monitor the efficacy of an anticancer treatment in real time can have a critical effect on the outcome. Currently, clinical readouts of efficacy rely on indirect or anatomic measurements, which occur over prolonged time scales postchemotherapy or postimmunotherapy and may not be concordant with the actual effect. Here we describe the biology-inspired engineering of a simple 2-in-1 reporter nanoparticle that not only delivers a cytotoxic or an immunotherapy payload to the tumor but also reports back on the efficacy in real time. The reporter nanoparticles are engineered from a novel two-staged stimuli-responsive polymeric material with an optimal ratio of an enzyme-cleavable drug or immunotherapy (effector elements) and a drug function-activatable reporter element. The spatiotemporally constrained delivery of the effector and the reporter elements in a single nanoparticle produces maximum signal enhancement due to the availability of the reporter element in the same cell as the drug, thereby effectively capturing the temporal apoptosis process. Using chemotherapy-sensitive and chemotherapy-resistant tumors in vivo, we show that the reporter nanoparticles can provide a real-time noninvasive readout of tumor response to chemotherapy. The reporter nanoparticle can also monitor the efficacy of immune checkpoint inhibition in melanoma. The self-reporting capability, for the first time to our knowledge, captures an anticancer nanoparticle in action in vivo. Evan Johnson had battled a cold for weeks, endured occasional nosebleeds and felt so fatigued he struggled to finish his workouts at the gym. But it was the unexplained bruises and chest pain that ultimately sent the then 23-year-old senior at the University of North Dakota to the Mayo Clinic. There a genetic test revealed a particularly aggressive form of acute myeloid leukemia. That was two years ago. The harrowing roller-coaster that followed for Mr. Johnson and his family highlights new directions oncologists are taking with genetic testing to find and attack cancer. Tumors can evolve to resist treatments, and doctors are beginning to turn such setbacks into possible advantages by identifying new targets to attack as the tumors change. His course involved a failed stem cell transplant, a half-dozen different drug regimens, four relapses and life-threatening side effects related to his treatment. Nine months in, his leukemia had evolved to develop a surprising new mutation. The change meant the cancer escaped one treatment, but the new anomaly provided doctors with a fresh target, one susceptible to drugs approved for other cancers. Doctors adjusted Mr. Johnson’s treatment accordingly, knocked out the disease and paved the way for a second, more successful stem cell transplant. He has now been free of leukemia for a year. Now patients with advanced cancer who are treated at major centers can expect to have their tumors sequenced, in hopes of finding a match in a growing medicine chest of drugs that precisely target mutations that drive cancer’s growth. When they work, such matches can have a dramatic effect on tumors. But these “precision medicines” aren’t cures. They are often foiled when tumors evolve, pushing doctors to take the next step to identify new mutations in hopes of attacking them with an effective treatment. Dr. Kasi and his Mayo colleagues—Naseema Gangat, a hematologist, and Shahrukh Hashmi, a transplant specialist—are among the authors of an account of Mr. Johnson’s case published in January in the journal Leukemia Research Reports. Before qualifying for a transplant, a patient’s blasts need to be under 5%. Then as mysteriously as it began, a serious mycotic throat infection stopped. But Mr. Johnson couldn’t tolerate the chemo, and his blast cells were on the rise. A two-drug combination that included the liver cancer drug Nexavar, which targets the FLT3 mutation, knocked back the blast cells. But the stem cell transplant in May, which came from one of his brothers, failed to take, and he relapsed after 67 days, around late July. He was put into a clinical trial of an experimental AML drug being developed by Astellas Pharma of Japan. He started to regain weight. In November 2014, doctors spotted the initial signs in blood tests that Mr. Johnson’s cancer was evolving to acquire a new mutation. By late January, he relapsed again , but there was a Philadelphia chromosome mutation, a well-known genetic alteration associated with chronic myeloid leukemia. It also is a target of the blockbuster cancer drug Gleevec and several other medicines. • The article reports on a case of AML that underwent clonal evolution. 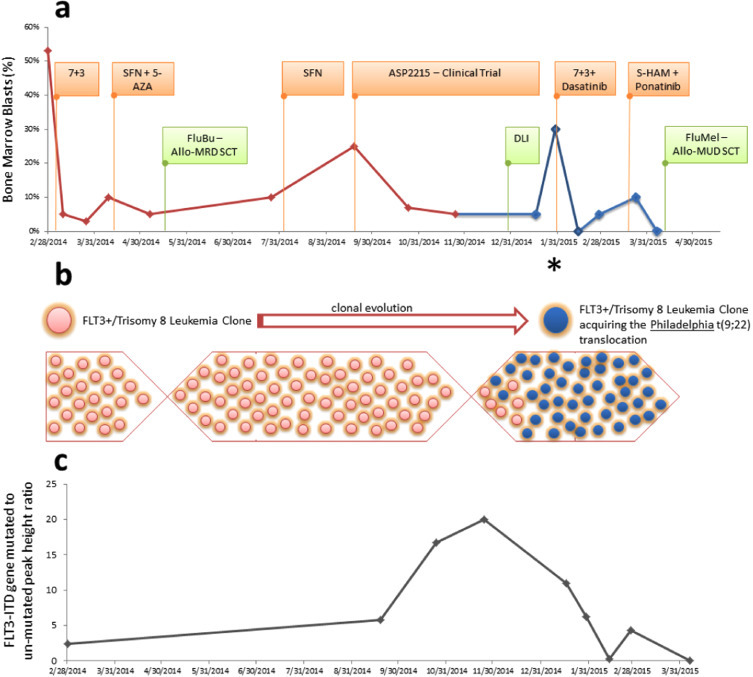 • We report on novel acquisition of the Philadelphia t(9;22) translocation in AML. • Next generation sequencing maybe helpful in these refractory/relapse cases. • Novel FLT3-inhibitor targeted therapies are another option in patients with AML. • Personalizing cancer treatment based on evolving targets is a viable option. The development of kinase inhibitors for the treatment of leukemia has revolutionized the care of these patients. Since the introduction of imatinib for the treatment of chronic myeloid leukemia, multiple other tyrosine kinase inhibitors (TKIs) have become available. Additionally, for acute myeloid leukemia (AML), identification of activating mutations in the FMS-like tyrosine kinase-3 (FLT3) has led to the development of several FLT3-inhibitors , ,  and . The article herein reports a unique case of AML that underwent clonal evolution while on a novel FLT3-inhibitor clinical trial. Our work herein presents clinical and next generation sequencing data at the time of progression to illustrate these important concepts stemming from Darwinian evolution . We describe novel findings alongside data on treatment directed towards actionable aberrations acquired during the process. Our work focuses on a 23-year-old male who presented with 3 months history of fatigue and easy bruising, a white blood count of 22.0×109/L with 51% circulating blasts, hemoglobin 7.6 g/dL, and a platelet count of 43×109/L. A bone marrow biopsy confirmed a diagnosis of AML. Initial cytogenetic studies identified trisomy 8 in all the twenty metaphases examined. Mutational analysis revealed an internal tandem duplication of the FLT3 gene (FLT3-ITD). He received standard induction chemotherapy (7+3) with cytarabine (ARA-C; 100 mg/m2for 7 days) and daunorubicin (DNM; 60 mg/m2 for 3 days). His induction chemotherapy was complicated by severe palatine and uvular necrosis of indeterminate etiology (possible mucormycosis). Bone marrow biopsy at day 28 demonstrated persistent disease with 10% bone marrow blasts (Fig. 1). Due to his complicated clinical course and the presence of a FLT3-ITD, salvage therapy with 5-azacitidine (5-AZA) and sorafenib (SFN) was instituted. Table 1. The highlighted therapies were employed in this particular case at various time points as shown in Fig. 1. J.E. Cortes, D.W. Kim, J. Pinilla-Ibarz, et al. F. Ravandi, M.L. Alattar, M.R. Grunwald, et al. N.P. Shah, M. Talpaz, M.W. Deininger, et al. Y. Alvarado, H.M. Kantarjian, R. Luthra, et al. C.C. Smith, C. Zhang, K.C. Lin, et al.